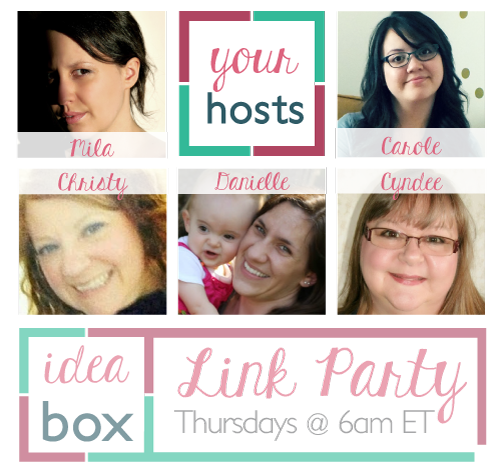 Since March is all about relationships, I am super excited to tell you all about the brand new link party that I am co-hosting with a few awesome bloggers. I can't think of a better way to improve my relationships in blogland than to start this adventure with these lovely ladies, and to give all you creative people a new place to party. Idea Box is a new weekly link party for bloggers to share all of their creative posts---recipes, home decor, DIY projects, gardening tips, good advice... Whatever your creative heart desires. While Idea Box is still a baby, it will be open from Thursday - Tuesday to give you all plenty of time to link up and tell all your friends. Now, meet your Idea Box hosts! Each week, the most viewed link will be posted across all of our blogs. We will also be choosing and featuring our favourites on our own blogs each week--so make sure you follow all our social media accounts! 5. You can add up to three links each week. Thanks for joining! I'll be sure to hop on over.